Did you see the recent BBC programme, ‘Stacey Dooley Investigates: Fashion’s Dirty Secrets’? I finally caught up with this documentary a couple of weeks ago after hearing so much about it. I was left feeling totally and utterly shocked and saddened by what I learnt. I had NO idea how bad things were. But now I do, and I need to share. I knew fast fashion was bad. But I didn’t know how bad. I must at this point add that I don’t buy cheap clothes myself and I haven’t for a long time. I prefer to invest in fewer, quality pieces that I love and that I know suit me. I also recognise that I could be doing better and I’ve shared my tips below. I feel as though my eyes have been well and truly opened to the devastating impact that the fashion industry is having on the planet, as well as the communities that live in the areas where the factories are producing fast fashion. I realise that I have a platform to inform, educate and inspire and I need to use it. There are things we can all do to minimise our own impact on the word. And I know from the many emails I’ve received since I discussed this on a recent Facebook Live, that many of you in this community are already really clued up on this subject (much more than I was). You’ve been sharing lots of sustainable fashion brands and articles with me and I am collating them into one document that I will share once it’s ready. The fashion industry is the second largest polluter in the world after oil. Six out of ten items of clothing end up in landfill within 12 months of production. Cotton production uses more water than any other fibre. A beautiful sea in central Asia has been drained of water by factories producing fast fashion. They re-routed the rivers to feed their factories. It is now a huge land mass. The image of a camel standing on the dry seabed will stay with me forever. The waste that is dumped into rivers from these factories is polluting river water that communities rely on, to devastating effect. For thousands of years cotton was grown sustainably. Fashion brands used to bring out two collections per year and people bought fewer clothes and wore them more often. 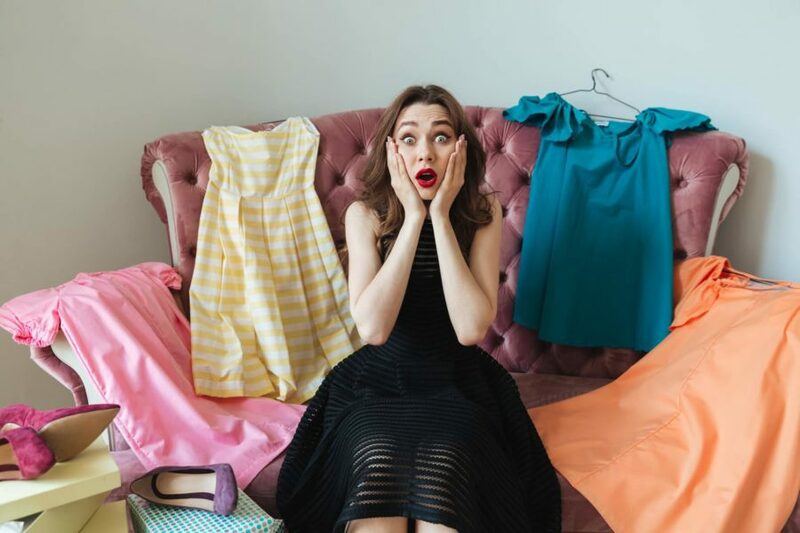 Fast fashion means that new collections are released weekly in some cases, and some women are buying a new dress for Friday night and then getting rid. Clothes are so cheap and the temptation and pressure to be dressed top to toe in the latest new look is so high, that this this way of shopping has become the norm for millions of people around the globe. We have to change our habits (I know you are very unlikely to have these habits, but I’m sure we could all do better than we do now). Here are 5 simple things that you can do to make a difference. Don’t buy cheaply made clothes. Buy second-hand or from sustainable brands where possible. Wear what you buy for longer. We need to celebrate longevity and repeat wears. Your carbon footprint will reduce dramatically by wearing clothes for even one year longer. Be prepared to pay more for clothes that have been produced in a more sustainable way. If you haven’t already, find out what suits you. Buy once and buy well. Since I watched the documentary I’ve been researching. There are many more sustainable brands out there than I was aware of, I just had to do some digging to find them (and thank you to all of you that have shared what you know with me). I’m compiling a list which I promise to share. Please use the comments thread on this post so that any advice and tips you have can be shared among us all. You are such a wise bunch, let’s talk more about this vital issue, encourage each other to change habits and each do our bit to make a difference. Now that the fashion industry’s dirty secrets have been revealed, we can start to influence change. Brands will have to listen and let’s pray that things will change. Another way to help the environment is to donate to charity anything not worn that is just sitting in the wardrobe. That way someone else may get use from the item and it will mean they will not have to make another purchase which will add to the problem. I saw the documentary and like you, Helen, was really shocked by how damaging the fashion industry is to our environment. It will be good to read your future blogs on kinder brands. There are more brands out there than I first thought but there is still a LONG way to go! Would be really interested in your sustainable brands list Helen. great blog! If you drop me an email Joanne, I will send it out to you. Thank you for this, it’s an important thing to recognise. There’s a brilliant app that I use called Good On You that rates clothing companies and their ethics – from using animal products to labour rights and environmental impact. Thanks Talitha, I have downloaded the app. Great tip.